To ease the way of getting fellow blogger’s blog, here I spotted out the list of bloggers all over the world. Also I include some of the important websites for the use of bloggers, by which you can create pdf files, video’s, sales page and goes on. For Your Information: Almost i tried to include all the blog's address as much as possible, If your blog is not listed here, send your website to nirmal@classiblogger.com or drop your website at the comment section below or add your blog by click here. I will add it immediately. Without the knowledge of other blogger's, i added their website, if you not interested in adding your blog here, let me know i will delete it. If you add your blog’s address here, you can get more traffic and backlink to your blog for free. Don’t Miss It Guys. I didn’t categorize the types of blog, it’s because you have to go through to all the blogs. That’s it. Here i gave the list of bloggers in Tamilnadu, India and all over the World. Thanks for coming. Included your site. Nice list. You can add my blog too. Thanks for your comment. Yes, i added your blog here bro. Check it. Your site is really good. The content is also helped me a lot. 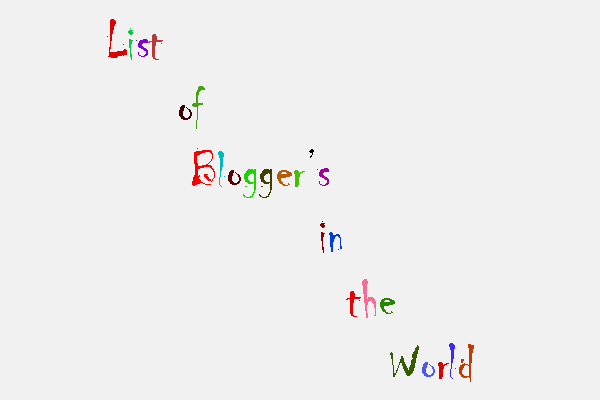 And this list of blogger is really awesome as all the site are the top blogging site having good PR. Glad you like my post as well as my blog. Thanks for dropping your comment here. Keep coming bro. Welcome to my blog. Glad you found this post as useful. Thanks for dropping your comment. Keep coming. This type of articles really helpful for new bloogers like me really useful keep going bro all the ver best. Yes. This post will be surely helpful for the bloggers as well as newbies. Glad you like this post. Keep coming. Great list. I think you have all the blogs listed here which I ever visited and even new ones here are. Simply great. But the post title says “list of bloggers but this is the list of blogs” right? Thanks for spotting out the mistake i have done here. I ll rectify it soon. Keep coming. Nirmal you have definitely done lot of hard work for writing this post. This is the first time I have seen a blogger mentioning so many blogs in a single post itself. While going through the blogs mentioned by you, I started searching that whether any of my blogs is mentioned by you. Nirmal you’re definitely a classic blogger as you never forget the importance of connecting with other bloggers. Building better relationship with other bloggers is an important task for every blogger. He i tried at-most to share the blogs of others. Anyway thanks for your kind words. Hello, first thanks for collecting this kind of blogger’s blogs. Thanks for your interest in adding your blog here. I updated your blog. Keep coming. I must appreciate for the list you are building of blogs all over the world. Thanks for your appreciation. Keep Coming. Your blog has been updated. Thank you for adding my blog in the list. Sorry I forget you. I added your blog in the list. Keep coming. Thanks for your appreciation. Your’s added. This is really huge list of blogs. It is a great effort by you. You can add my blog dezinewave.com too in this list. Sir, Great Collection, but I found some broken links.